The Ole Miss Women’s Council (OMWC) and the Ole Miss Dean of Students Office for Leadership Involvement hosted their annual leadership conference, PULSE, Preparing Undergraduate Leaders-a Student Experience, Friday and Saturday, January 20 – 21, 2017 at the University of Mississippi. 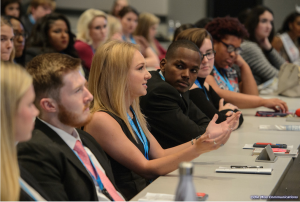 During the two-day leadership conference, students heard from a variety of speakers and learned about the multiple facets of leadership, and how to apply these concepts to the real world. Sam Haskell, Best Selling Author, Warner Brothers Producer (Coat of Many Colors and Christmas of Many Colors partnered with Dolly Parton) and CEO of the Miss America Organization and Miss America 2017, Savvy Shields were the keynote speakers on Friday night. After the presentation, students participated in a question and answer session, and attended a reception. Other speakers for the conference included Markeeva Morgan, Ole Miss Alumni and Avionics Hardware Manager for the Nasa Space Launch System Program, Jeff McManus, Director of Landscape Services for Ole Miss, and Julia Winston with Brave Communication. All conference attendees received a copy of Strength Finder 2.0, took the assessment, and heard from Evan Nelson with The Oracle Leadership Company, on how to implement their results into leadership roles. The conference concluded with a panel of senior students, who addressed questions from the audience. This was the fourth year that the OMWC and Dean of Students Office for Leadership Involvement hosted the conference.